1.) 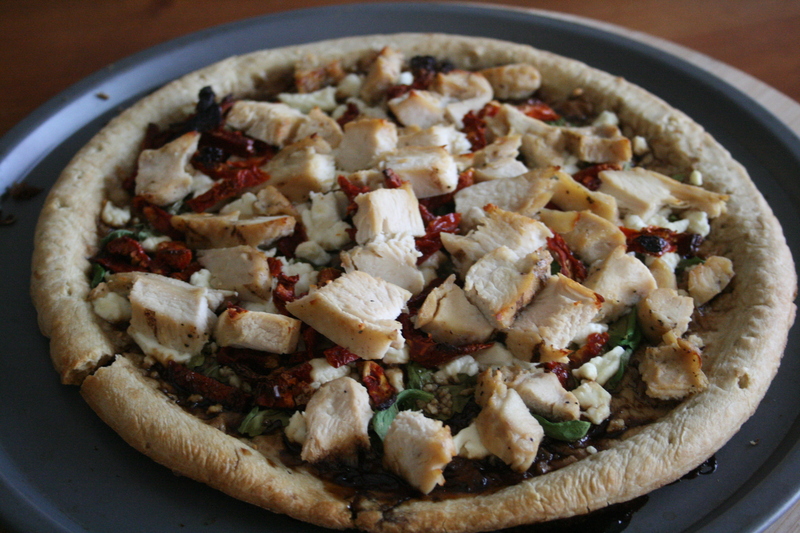 Man Pizza – A BBQ chicken, bacon, and mushroom pizza that my best friend and I ate far too often in college. 2.) Zesty Veggie Pizza from Cici’s – Who knows why? It’s different and I pretend it’s healthy. 3.) The Sun-Dried Tomato & Arugula pizza from Studio Movie Grill. In case you don’t know what Studio Movie Grill is, SMG is a movie theatre that serves you food while you watch your film. They also have nights where they have food and drink specials, my favorite being All You Can Eat Pizza Wednesdays. Alas, my 3rd exception to the no-pizza rule is on their menu so I shamefully eat as much of it as possible. A few weeks ago I realized I didn’t have to wait until Wednesdays to cram all of this doughy goodness into my mouth. I tried it out at home but added grilled chicken on top for some extra protein. I was impressed with how spot-on it tasted since I was just going off of sense memory. 1. Pre-heat oven to 425 F.
2. In a small saucepan, heat balsamic vinegar and sugar over medium heat until sugar is dissolved and glaze begins to thicken. 3. Lightly spread glaze on pizza crust. 4. Top the glaze with feta, tomatoes, and arugula. 5. 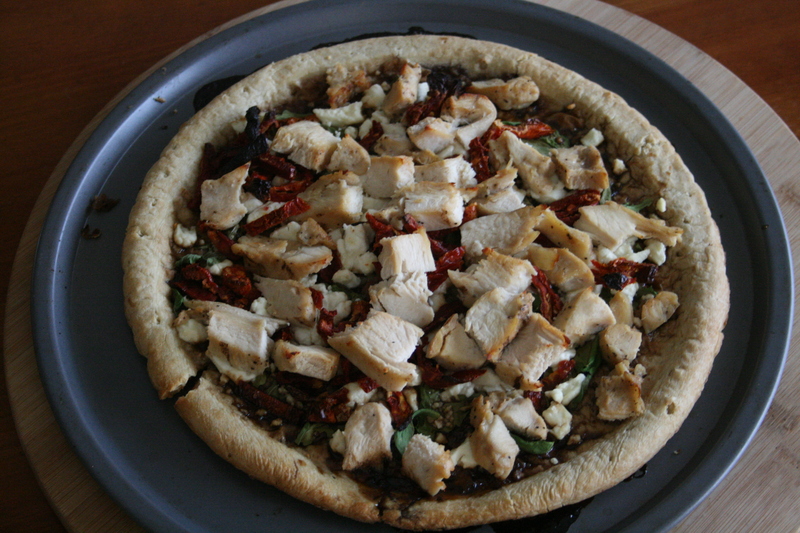 Evenly distribute your chicken pieces onto the pizza. 6. Bake for 20 minutes, or until crust is golden brown. 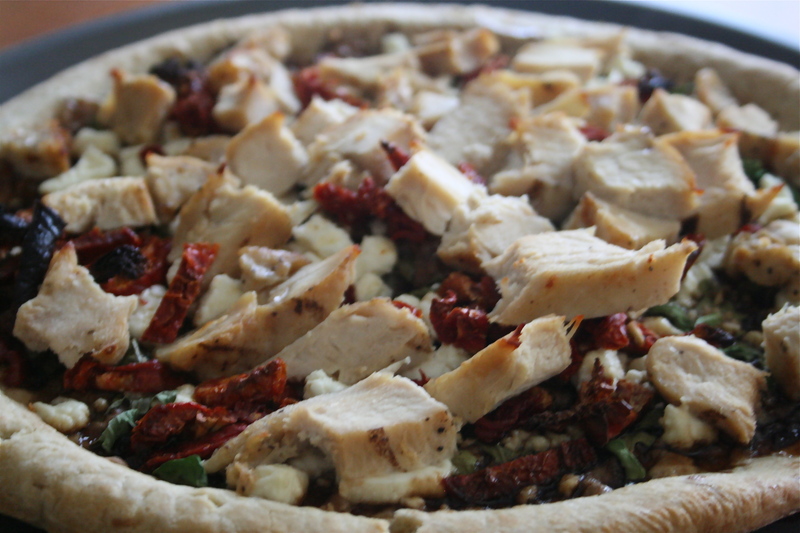 This entry was posted in Main Dishes and tagged arugula, feta, grilled chicken, main dish, pizza, sun-dried tomatoes. Bookmark the permalink.